You can be paid via Paypal or Payoneer. PayPal is our recommended payment option, as there is never a charge to creatives for payments made to your PayPal account. If you do not have a PayPal account, we recommend that you register an account right now. For creatives who reside in a country where PayPal payments are not available, you can choose to be paid via Payoneer. Payoneer gives you the option to be paid via bank transfer into your account or a prepaid Mastercard. There may be charges applied to your payments via Payoneer. We make payments via PayPal every Monday, Wednesday, and Friday. It can take up to 10 business days for your payment to be processed. Please wait at least 10 business days before contacting the support team to inquire about a payment. Please be aware that if this is your first win, or if you are a newly registered creative, your payment will be held for 30 days. After the 30 days have passed you can schedule your payment as usual. In your Account section, there is a tab labeled "Payments" that will take you to your Payments screen. This screen is where your Paypal or Payoneer account information lives. You can edit this information at any time. 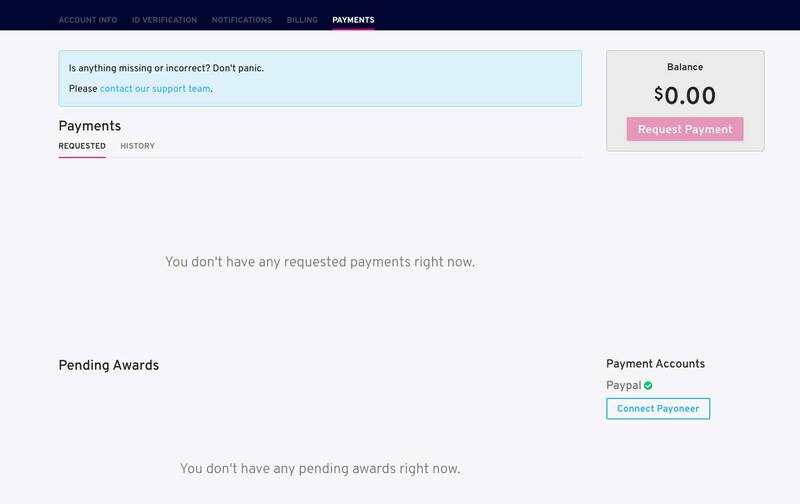 Your Payments screen is also where you will find any payments from the completed projects you have won. You can schedule your payments from here as they become available.